Building basements without wasting water | Save Palo Alto's Groundwater! City Council will review Staff’s recommendations for 2017 dewatering regulations on March 7th, 2017. Please join us for a special City Council meeting on Tuesday, March 7th at 6 pm (the City has changed the date several times; we will reconfirm date and time when the agenda is final) at City Hall, 250 Hamilton and let City Council and Staff know that groundwater (all water) is important to you, and that proven alternative construction methods can be used to preserve this water. California is a land of recurrent drought. It is time for better stewardship of our groundwater – it supports our buildings and infrastructure, it’s our hedge against drought, part of our emergency water supply, and our children’s birthright. In order to build a basement, the groundwater level needs to be lower than the basement’s foundation. When this level, the water table, is above the proposed basement’s foundation, it needs to be drawn down within the construction area; this is achieved by pumping the water out. 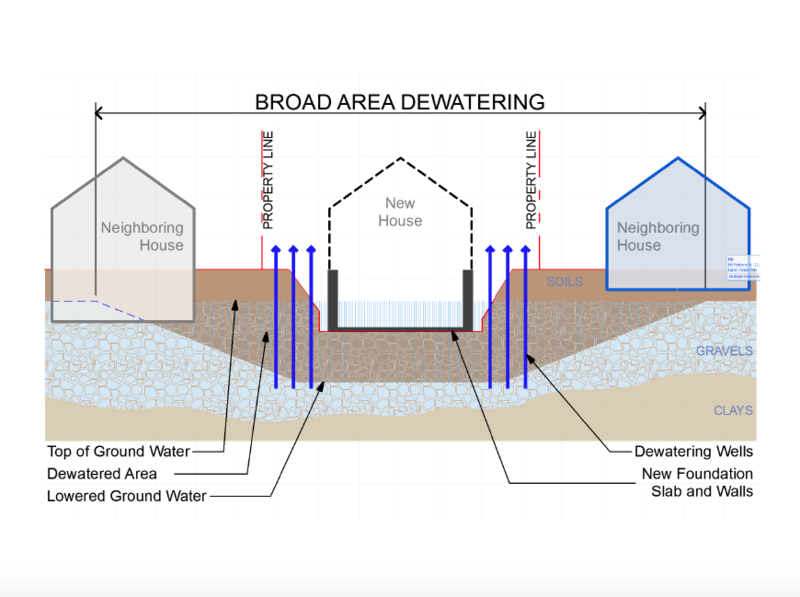 In broad area dewatering (BAD), the method currently used, the groundwater level is drawn down not only at the construction site but hundreds of feet away from it (see diagram). This is the equivalent of a localized drought for nearby neighbors and their properties. Depending on distance from dewatering site, type of soil, location, dewatering duration and other factors, broad area dewatering can affect nearby buildings, infrastructure and canopy. And, millions of gallons of groundwater are wasted. Last year’s average was 17.5 million gallons of groundwater per basement. For comparison, the amount of water required for fracking a well is between 2 and 10 million gallons. Due to our collective efforts to bring this issue to the City’s attention, Staff is proposing for 2017 a pilot program that encourages using alternative construction methods for building basements in areas with high water tables. It is voluntary because Staff wants to see if there are any unintended consequences before recommending it be mandatory. 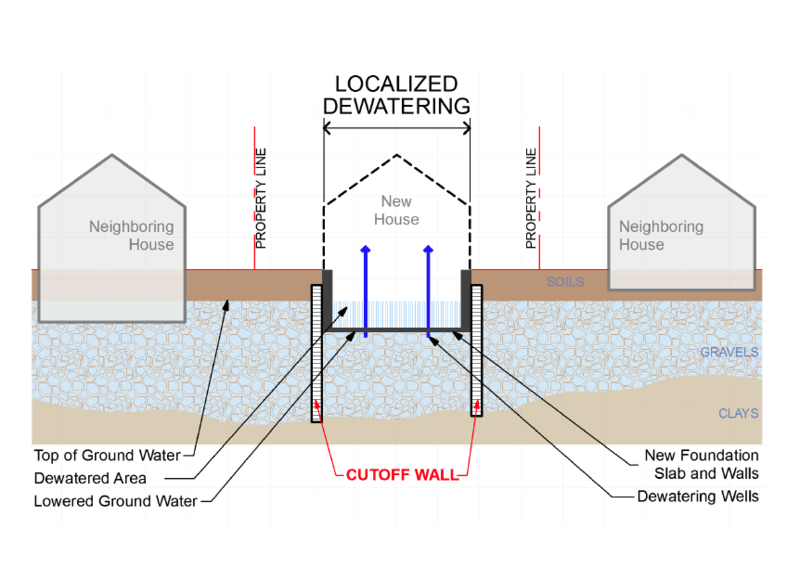 In alternative construction methods, also called local area dewatering (LAD), the use of cofferdams, sheet piles, cut-off or secant walls, etc., essentially limits the amount of groundwater that is pumped out for the underground construction (see diagram). The smaller amount of water pumped out via these methods is expected to be less than 10% of the amount pumped when broad area dewatering is used, and can then be percolated back to the aquifer or used beneficially such as for dust suppression, street cleaning, irrigation, etc. Local area dewatering not only limits the amount of water that is wasted but greatly reduces the risk of damage to neighboring properties, canopy and nearby infrastructure. Why would anyone choose broad area dewatering when local area dewatering has much lower impacts on the built and natural environment? Under current regulations, the dewatering applicant doesn’t pay for either the groundwater that is pumped out or for the use of the storm drains, where this groundwater is placed. For applicants, this has made broad area dewatering economically more attractive than local area dewatering. Meanwhile, the costs are externalized to us, the taxpayers. The wasting of this water is, however, not sustainable. It is time to protect our groundwater and its many benefits to our environment and us. Incentivizing local area dewatering and/or de-incentivizing broad area discharge can achieve this goal. Please show up on Mar. 7th and say that we want zero waste of our groundwater, a valuable community resource. This is a truly inspired presentation of the facts for all to see. I will of course be there on the 27th to lend support. There is only one rational choice for our city to take. Thanks for bringing this to everyone’s attention. Our neighborhood is facing a triple threat of (BAD) dewatering in the Spring of this year when the 900 N. California Ave. development begins construction of three 2-story homes plus full basements. 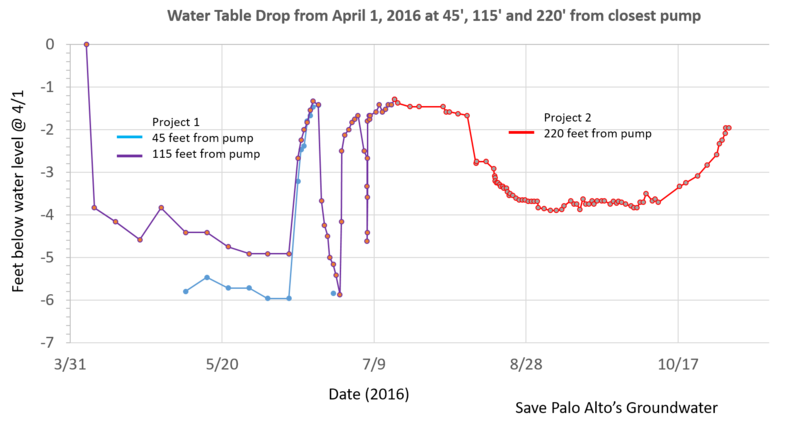 With our groundwater table being so high here( currently at 4 to 4.5 feet below surface) the amount of ground water that will be destroyed could be 75 million gallons or more. The risk of adjacent structural damage from ground settling to homes within 300 feet is serious. For all those who reside within 600 feet of this huge development, PLEASE come to the meeting at City Hall on February 27th and be heard.